Search for books using the search box on the top right-hand side of the screen. If you cannot access books please try again in 10 min. We have 6 licenses to Safari. This means 6 students can access this database at the same time. Typically, after 10 min. you should gain access to the ebooks. Call us and we will try to locate a relevant resource if you are unable to connect to Safari books. You have access to TexShare that allows you to check-out books from other college libraries, for example, UTSA. How to use the Safari app on your smartphone or tablet? 2. 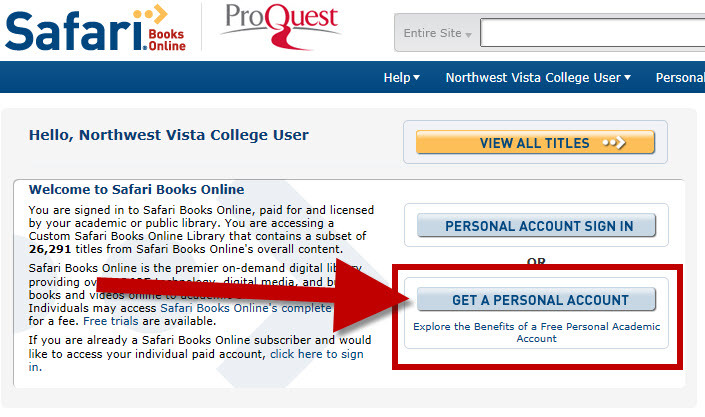 Look for this blue button - GET A PERSONAL ACCOUNT. 3. Safari will send you a password link to the email address you give them. 4. Download the app and use your email address and selected password.